The ASHAR class of 1998 suffered a tragic loss on August 12, 2009/ 22nd of Av, 5769 , when Dani Ladell z'l died in a swimming accident off the shores of Eretz Yisrael. As we all know, Dani' z'l was someone who exemplified refined character traits combined with a passion for learning Torah and Science. Dani z'l was our 8B salutatorian and was planning on attending Sackler Medical School in Israel before his untimely petira. 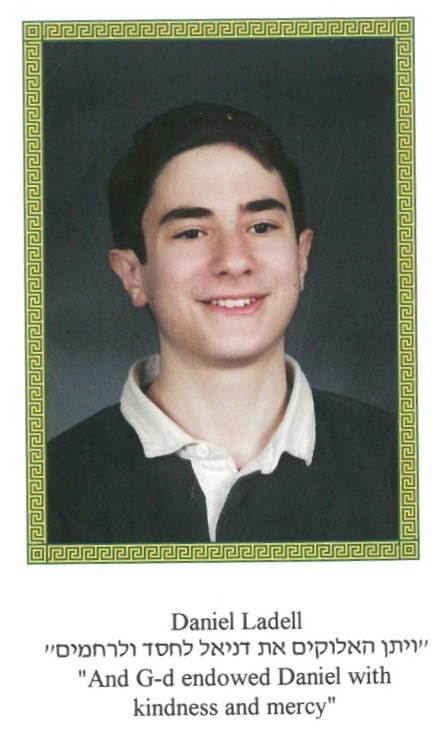 To honor his memory, our class is dedicating an ongoing annual award for the ASHAR graduation, called the "Dani Ladell z'l Memorial Award for Excellence in Torah and Science" to be given to a student that personifies what Dani z'l stood for. May the tzedaka that we give be an iluy for Dani z'l's neshama and be a merit for all of klal yisrael.